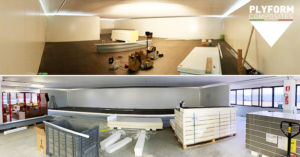 These days we are working to finalize Plyform new cold storage for stocking pre-pregs. The room will be 170 sq.m. with the capacity of storing 30000 sq.m. of material, pre cell of 0°C and an inside cell temperature of -20°C. The advantages this new freezer will bring are the possibility of splitting into separate areas to store separately, depending on the material and the customer, the continuous monitoring of different areas of the cell according to customer specifications and an easier and faster handling of materials.